View the printable PDF version. 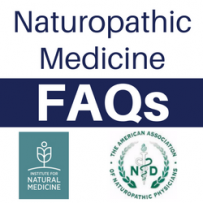 The AANP and the INM would like to acknowledge Kasra Pournadeali, ND, for his contributions to the content of this FAQ. Forty-six percent of U.S. adults, and nearly 80 percent of those aged 65 and older have high blood pressure, or hypertension, according to new guidelines from the American Heart Association. High blood pressure, which often occurs without symptoms, boosts the risk of stroke and heart disease. Further, patients diagnosed with high blood pressure are estimated to pay almost $2,000 more in annual healthcare costs than those who have blood pressure in the normal range. While blood pressure medications represent some of the greatest advances in healthcare pharmacology, they have side effects and consequences with long-term use. Whole-body health evaluation and care is vital to identify the underlying cause(s) of high blood pressure, to proactively make changes that can impact overall health, and to minimize reliance on prescription medications when possible. Licensed naturopathic doctors (NDs) are trained to evaluate and treat the whole person. They help patients identify the well-known causes of and modifiable risk factors for hypertension, as well as less-examined causes that include vitamin and mineral deficiencies and inflammation. What do blood pressure numbers really mean? Your blood pressure measurement is made up of two numbers that reflect the different pressures in your blood vessels. The systolic number is the pressure in your vessels when your heart contracts, and the diastolic number is the pressure when your heart is at rest between beats. Numbers greater than the ideal range indicate that your heart is working harder than ideal to pump blood to the rest of your body. Over time, untreated high blood pressure damages the delicate tissues inside blood vessels, in the eyes, brain, heart, and other areas. This can cause blindness, atherosclerosis (clogged arteries), and stroke. High blood pressure can also impact kidney function and in long term and severe cases, cause kidney failure. Causes of high blood pressure are different for every person and are often called “risk factors.” Well-known modifiable risk factors include: being overweight or obese, having a sedentary lifestyle, using tobacco, having an unhealthy diet (high in sodium), excessive alcohol usage (more than one drink per day for women and two drinks per day for men), stress, sleep apnea, and diabetes. Non-modifiable risk factors include: age, race, and family history. Other well-known causes of high blood pressure include side effects from certain medications, hormonal imbalances, and kidney disease. Naturopathic doctors take enough time to identify and address the genetic, environmental, and behavioral/lifestyle factors that raise blood pressure. NDs offer a large spectrum of treatments including: clinical nutrition, exercise prescriptions, botanical medicine, behavioral medicine, and, at times, standard medications. Naturopathic doctors work with and refer to other physicians and specialists when indicated. Because of their extensive training in clinical nutrition, NDs are well-equipped to help people with diets and nutrition, which is essential. A large body of evidence now supports specific diets in the treatment of high blood pressure. Naturopathic doctors provide highly individualized therapies. They follow the Therapeutic Order, leading with minimally invasive therapies that support the body to restore healthy function, whenever possible. Meeting the patient where they are, NDs might recommend dietary approaches, vitamin supplements, exercise training, stress management, or even prescription medications when needed, depending on the unique situation of each patient. The naturopathic medicine principle of recognizing the healing power of nature always brings NDs back to health-promoting, natural approaches that support the body’s effort to repair itself. Find a time when you can rest for several minutes. Use a cuff that will inflate and deflate automatically. Sit comfortably and keep arms at heart level. Take your measurement 2 to 3 times, between 1 and 2 minutes apart. Write the numbers down. If there is something stressful happening, make a note of that, too. Take your recorded measurements to your doctor. Measure twice daily: once in the morning and once in the afternoon/evening, 30 minutes before eating, drinking, or exercising. ← What Do Naturopathic Doctors Mean by Treat the Whole Person?